On Wednesday evening the Federal Reserve finally ended an unprecedented seven year period of near zero interest rates and what amounted to emergency monetary policy settings. After months of speculation and anticipation the Federal Open Market Committee (FOMC) announced it would be raising the US benchmark interest rate for the first time since June 2006. The interest rate was increased by 25 basis points from 0.25% to 0.50%, in line with our and indeed the markets expectation. Critically, the decision was a unanimous one, with all members of the committee voting for an immediate rate increase. Policymakers judged that there has been “considerable improvement in the labour market” this year and, while inflation remains well below target, there is “reasonable confidence” that price growth will move higher over time. Headline inflation, however, is expected to remain low for some time, only increasing back up towards its 2% target in 2018. On the topic of future rate increases, the FOMC sent mixed signals. The statement suggested that the evolution of economic conditions would likely “warrant only gradual increases” in the future, but the “dot plot” of future hike expectations of FOMC members was unchanged from September – and considerably more hawkish than markets are pricing in. This emphasis on gradual rate hikes initially weighed on the US Dollar, although the currency strengthened as the US trading session progressed, ended higher against both the Euro (Figure 1) and Pound (Figure 2). Currency markets clearly took the decision in their stride, which is unsurprising given the outcome was so widely expected. The Federal Reserve’s first interest rate hike since June 2006 does, however, provide a clear sign that the world’s largest economy is back on track following the most severe global recession in recent memory. Job creation and unemployment are improving, economic growth is robust, while inflation is on an upwards trend. The key to the short term evolution of the US Dollar will likely be the timing, and more importantly pace, of future US rate increases. 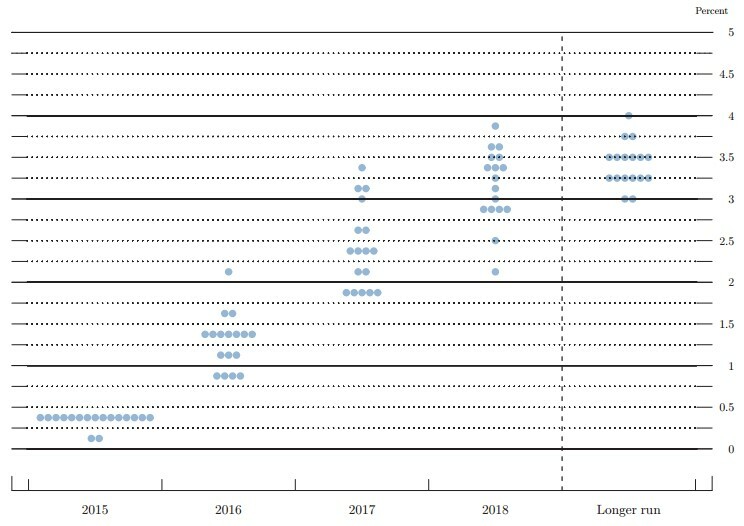 The Fed’s “dot plot”, which represents where each member expects the funds rate to be at the end of each year, was more or less unchanged from the previous meeting (Figure 3). A median calculation of policymakers’ expectations for next year suggest that the committee still expects to hike roughly once a quarter in 2016, the equivalent of every other meeting. This is in line with our expectations, although a faster pace than the market is currently pricing in, which at present stands at just two additional hikes next year. What does the future hold for USD? Gradually increasing interest rates in the US in 2016 should lead to an appreciation of the US Dollar against almost every major currency, despite Wednesday evening’s relatively muted movement in the Dollar. This appreciation will be particularly severe against the Euro, given the European Central Bank is moving its monetary policy in the opposite direction. Gains will be more gradual for the Dollar against Sterling, considering we expect higher interest rates in the UK at some point in the third quarter of 2016.